There! I knew that headline would grab your attention! Although I didn’t do much personal blogging of my bike rides in 2012, I did post almost 100 items into the blog I maintain for CTC Northampton. Having written today at this sister blog, I’m thinking I would share my words and photos here! 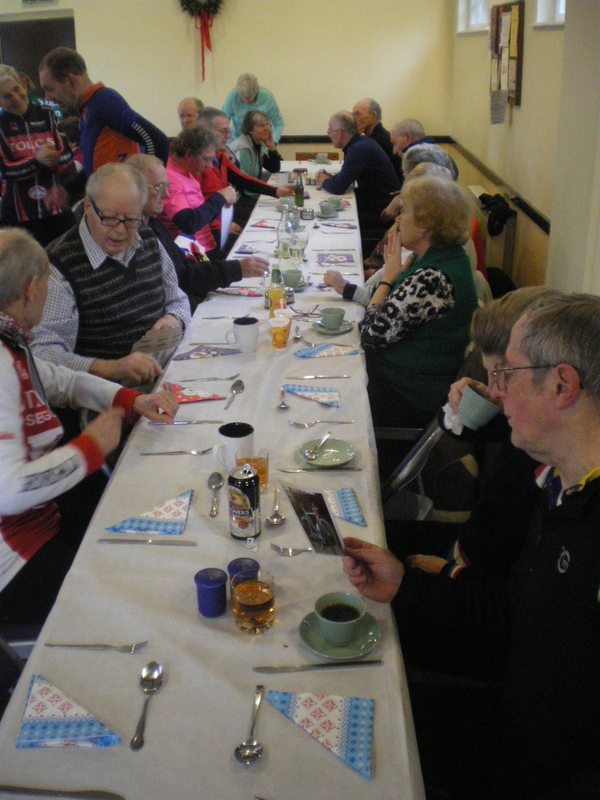 I enjoyed a splendid first ride of the year with CTC Northampton. Five of us met at the Brampton Valley Way in damp but mild conditions for a ride led by Bill. Having wished each other a Happy New Year, we went at a brisk but comfortable past north on the A5199 to Creaton and then onto country lanes through Naseby and Clipston before joining the A508 just south of Great Oxendon. We soon entered the Waterloo Farm café and met up with Max and our friends from CTC Kettering. 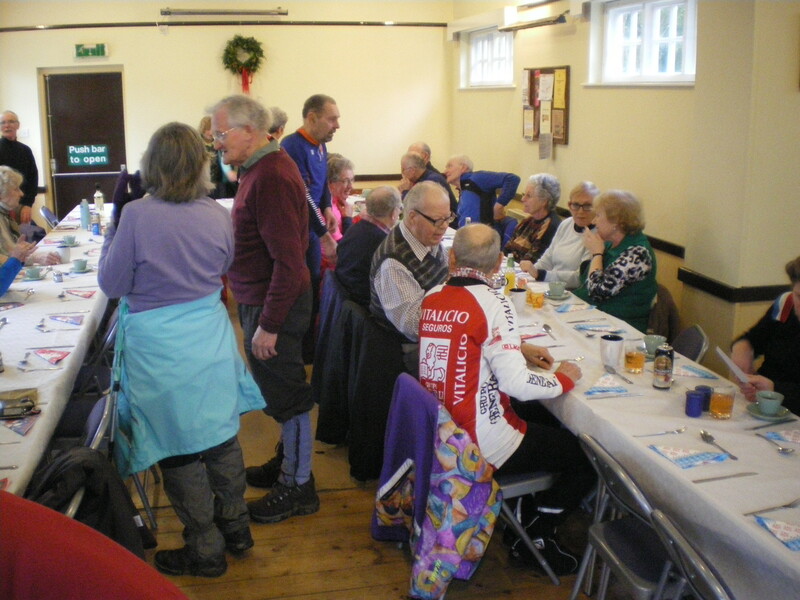 After refreshment – bacon sandwiches went down a treat – there were only five more miles to Sibbertoft where an excellent welcome awaited us not only from our CTC Leicestershire friends but also from the ladies of the parish church committee! 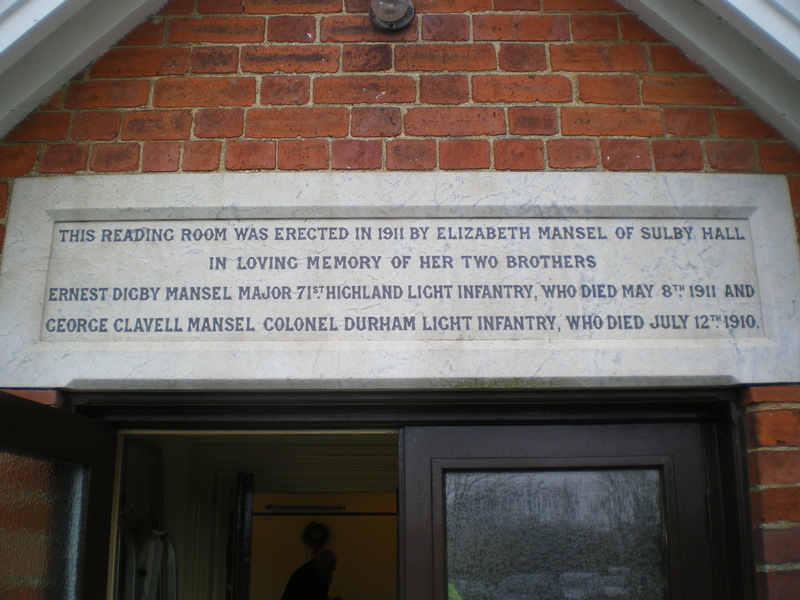 This was the annual New Year’s Lunch in the Sibbertoft Village Reading Room. Today her reading room was set out with tables for fifty cyclists to be served lunch by the ladies who are responsible for Sunday afternoon teas in the summer. Brilliant: shepherd’s pie, apple crumble and tea/coffee. And seconds, too! After a lovely lunch, it was a pleasure to cycle home. Bill led us via Naseby and Cottesbrooke to Brixwoth (and the A508 south to Northampton) but by different lanes so that we completed a figure of eight. Route here. And there was a final treat of the day. 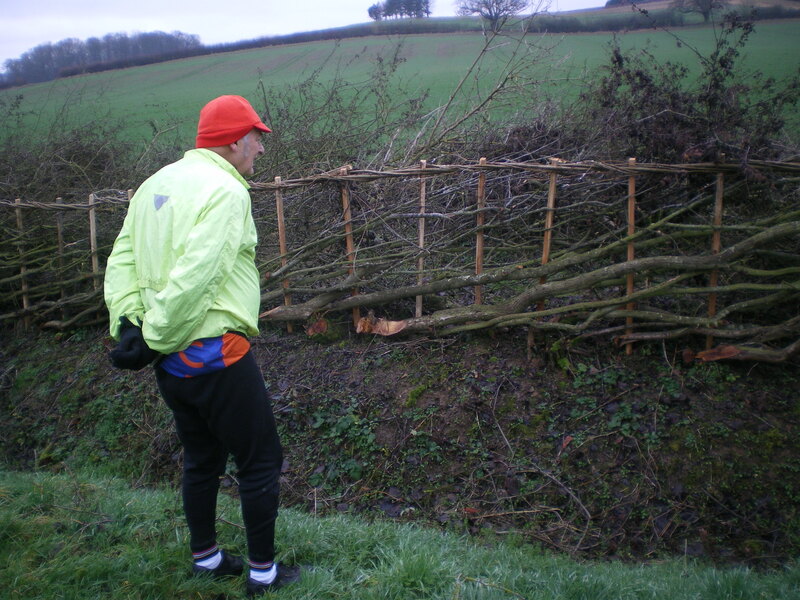 At an extensive hedge being layed at the edge of the Cottesbrooke estate we stopped and John gave us an extempore lecture on the craft of hedge laying. The hedge we studied was typical of the “South Midlands style” and was clearly “bullock-proof”. We could easily see its advantages over an adjacent hedge which had merely been strimmed. 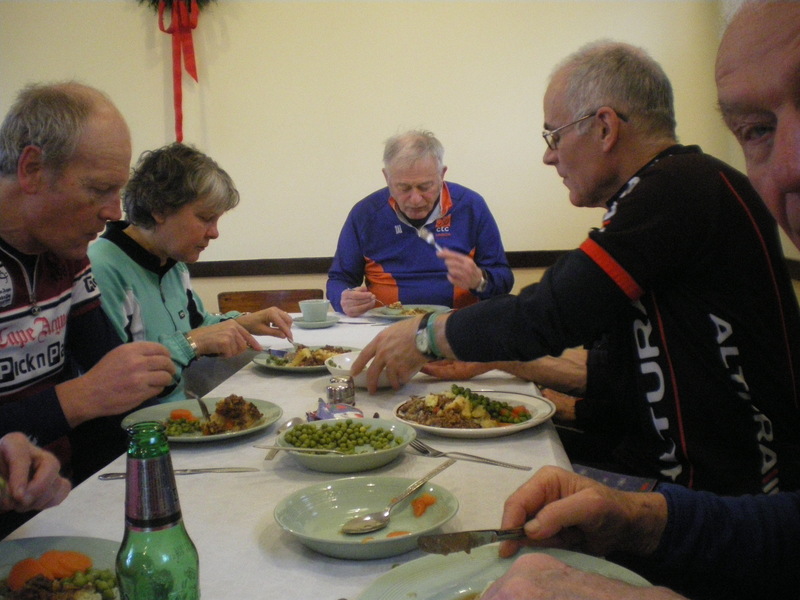 Big thanks to Bill for sorting out our route, to Max for reminding us about the event, to the CTC Leicestershire committee for the organisation, and to the Sibbertoft parish ladies for their hospitality! Splendid!! 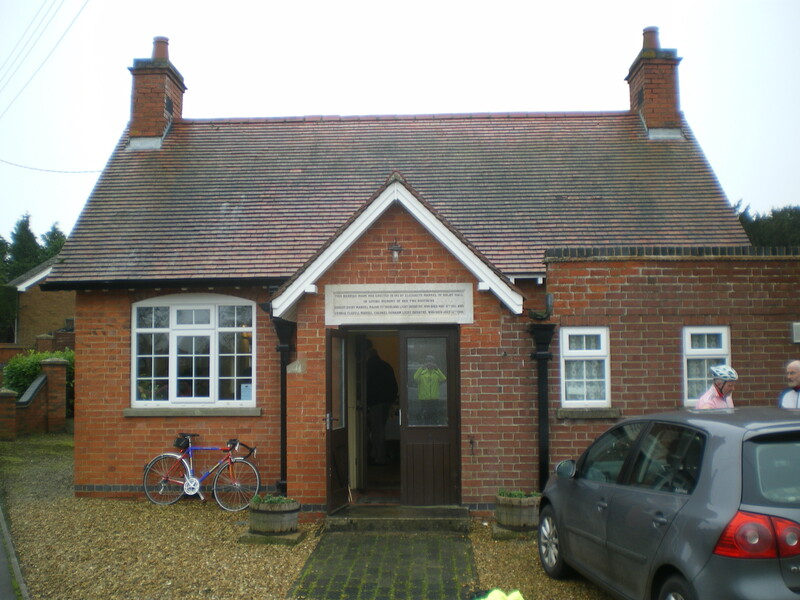 This entry was posted in CTC Northampton, Cycling and tagged Brampton Valley Way, Brixworth, Clipston, Cottesbrooke, Creaton, Great Oxendon, Naseby, Sibbertoft, Sibbertoft Village Reading Room, Waterloo Farm Café by ianmac55. Bookmark the permalink.